Richard Wiseman is the UK’s most popular psychologist, with books topping the bestseller charts, over 10 million views on his YouTube channel and more than 60,000 followers on Twitter. A former professional magician, he has spent the past 20 years investigating the psychology of the paranormal. His new book, Paranormality, tackles the psychology of seemingly supernatural phenomena. ‘Take, for example, our ability to unconsciously see faces and figures in meaningless stimuli’, Professor Wiseman says. 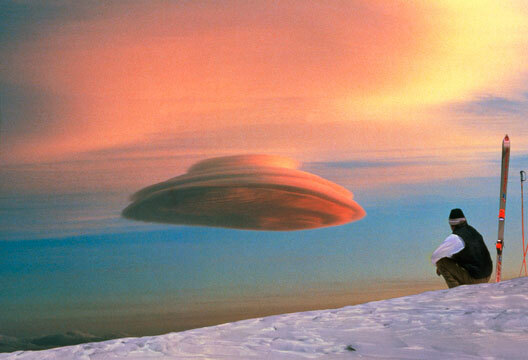 ‘This strange phenomena, known as pareidolia, is a fundamental quirk of the human perceptual system and fools us into seeing a face on Mars, the man in the Moon; Jesus in the Crystal Palace FC turf, Mother Teresa in a cinnamon bun, or, as shown here, a UFO in lenticular clouds’ (for more examples, see tinyurl.com/5dbwfe). If it all seems trivial, consider that someone paid $28,000 for the Virgin Mary on a piece of toast! A similar phenomenon is at work when people claim to hear satanic messages in songs being played backwards, such as Led Zeppelin’s ‘Stairway to Heaven’ (have a listen at tinyurl.com/48trcqm). - ‘Psychology 4 All’ is a one-day event to promote psychology and demonstrate its scientific basis and relevance. To book, see tinyurl.com/psych4all.